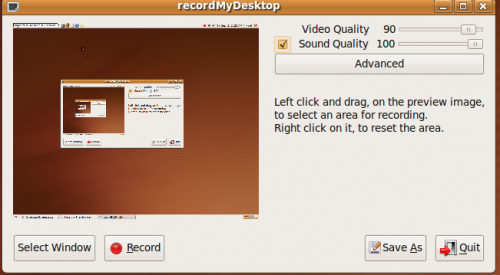 There is a desktop session recorder for Linux called recordMyDesktop that attemps to be easy to use, yet also effective at it’s primary task.recordMyDesktop offers also the ability to record audio through ALSA, OSS or the JACK audio server. Go to System->Administration->Synaptic Package Manager,type recordmydesktop in Quicksearch field. Right click gtk-recordmydesktop,select mark for installation.Mark to be install in next window. Then click Apply button to start install recordmydesktop. Screencasts of your desktop are very useful in demonstrating programs and for video tutorials. “recordMyDesktop” is a very easy to use tool for creating screencast under linux. By using recordMyDesktop you can record a widow or the whole desktop with a single click. You can save the video as ogv. A picture is worth a thousand words, especially when you’re teaching someone how to do something on a computer, and recordMyDesktop is a great little Linux application for creating screencasts. YouTube is full of recordMyDesktop screencasts showing all kinds of captures, including Compiz in action. Screencasting made simple is the ethos behind Linux screen-recording tool ‘Kazam‘ and the latest release sees it hammer home this point with improved features and a slew of bug fixes. The biggest improvement in Kazam 0.11 doesn’t come in the shape of new features, as welcome as they are, but in the big improvements to overall stability.